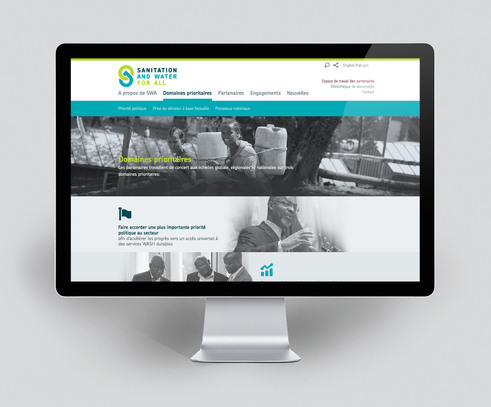 At the end of last year, we launched a bold new site for Sanitation and Water for All, a global partnership of the foremost leaders working to provide clean water and sanitation facilities around the world. 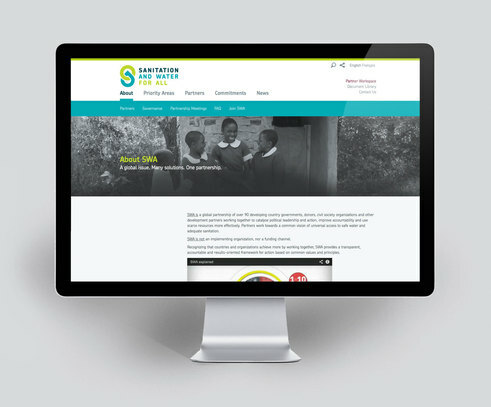 A direct extension of the brand platform that we launched last summer, the site is built to express the core attributes of coordination, transparency and accountability that SWA pledges to bring to the sector. 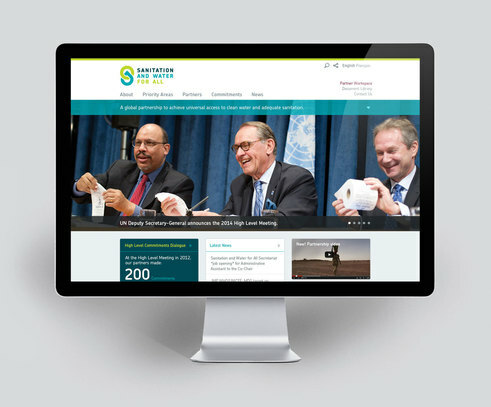 One of SWA's key functions is to bring together the global decisionmakers in the industry every two years at a High Level Meeting - including governments, donors, development banks, non-profits, and civil society. At these meetings, developing countries and donors are encouraged to make specific, measurable commitments to improve the state of water and sanitation. We quickly saw the website as an opportunity to publish this data in an accessible, dynamic format - to bring public accountability to the commitments, and transparency to the progress that has been made toward their promises made at the last meeting in 2012. 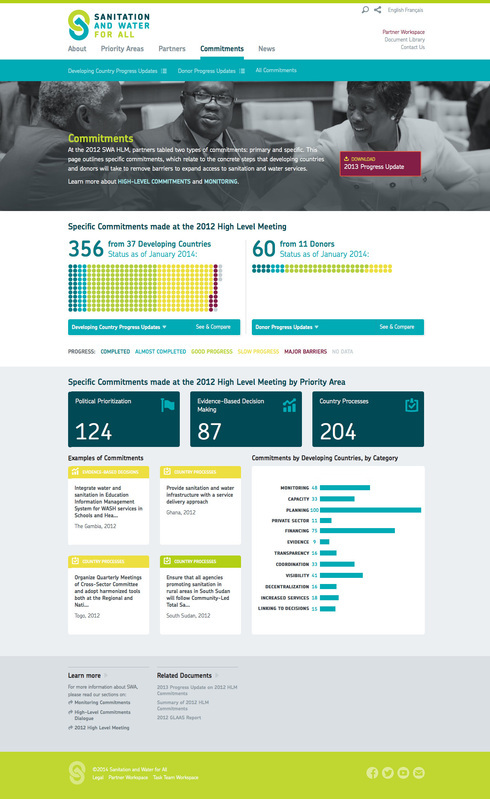 We made the Commitments data the centerpiece of the site - offering dynamic, searchable, and customizable insight into progress around the world, and prompting renewed interest in the promises. 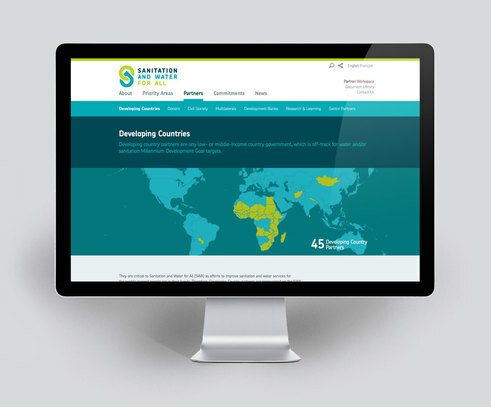 With the 2014 High Level Meeting only a month away, SWA partners around the world are using the SWA site as a tool to research the commitments and progress of their peers as they prepare a new round of commitments (which will of course be featured on the site). The landing page summarizes all commitments with dynamic infographics and high-level statistics. Key data is visualized in simple charts with color coding by progress level, and is dynamically filterable and storable by amount of progress, number of commitments, percentages, and topics. 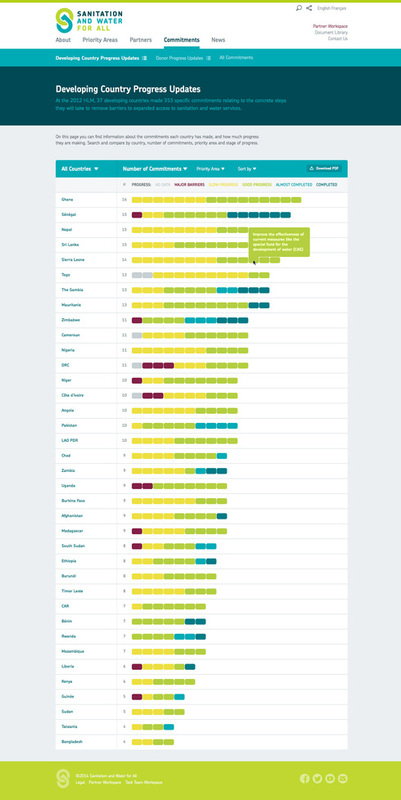 Each country has an overview Progress Report detailing their commitments and progress, with expandable panels offering details on challenges and milestones for each. The entire site is available in both French and English.